Base for Climbing the Northern Alps, or Rest Stop While Walking the Kamikochi Basin. Located a quiet, sylvan 1.5-hour walk from the Kamikochi Bus Terminal, Tokusawa-en is as far away from the hustle and bustle of the city as possible. Being in the middle of nature means a lack of many conveniences, but a nourishing meal and warm bath are the reward for making the trek. Popular as a base for climbing Mt. Yari or the Hotaka Peaks, as well as a rest stop for people walking the Kamikochi Basin. Open from late April to early Nov.
14 private rooms and 3 shared rooms available. Available for contact during the winter c/o Shimashima, Azumi, Matsumoto City 390-1502; tel (0263)94-2438; fax (0263)94-2059. From Shin-Shimashima Station then bus to Kamikochi Bus Terminal. (Matsumoto Matsumoto Electric Railway Kamikochi Line), 90 minwalk from the Kamikochi Bus Terminal. 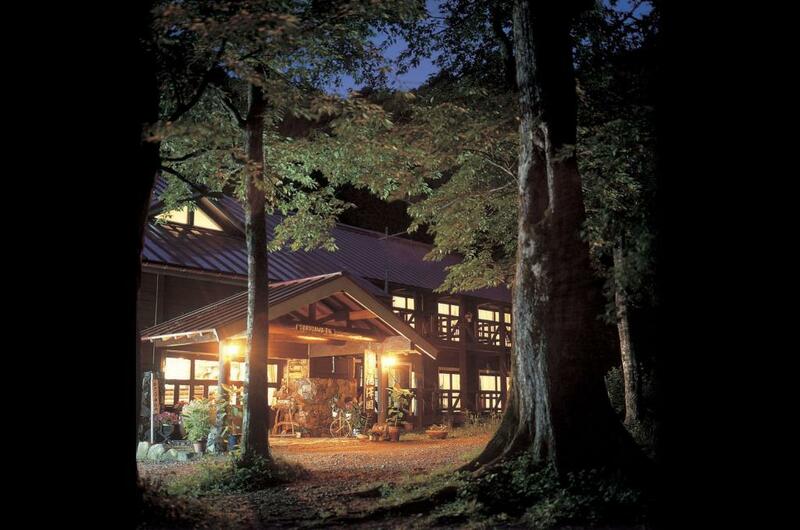 From Kappa-bashi Bridge, walk upriver past the Myojin area to the Tokusawa Campground to which the lodge is adjacent. Kamikochi is not accessible by private car.